Well it turns out there were a couple of bugs relating to how EbXL interacts with other mods and not doing things properly that led to us causing crashes on servers. Eelgrass no longer causes crashes on servers if a mod asks for the unlocalized name on the server. 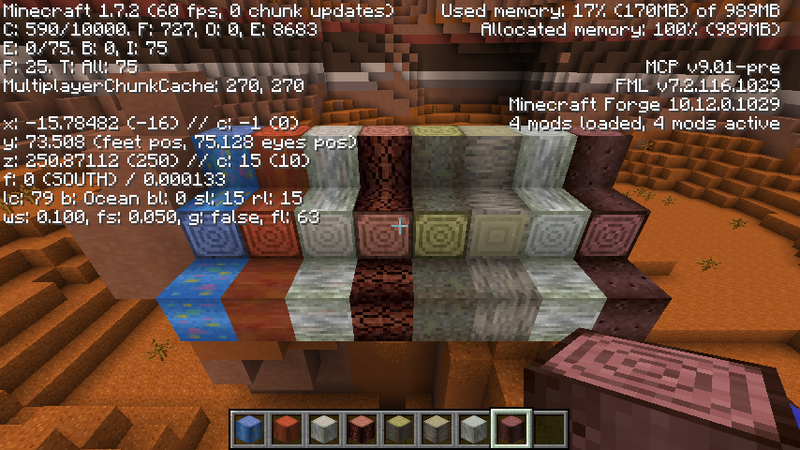 Our custom dyes no longer cause a crash if another mod asks for the unlocalized name on the server. Eelgrass can now grow on grass block under water so as to curtail it breaking if a dirt block changes due to grass spread. Well, work on the 1.7 update has finally started, and at the moment the foundations of the mod are undergoing a rewrite to try and make things easier to maintain in the future. As of right now, we are not totally sure if the 1.7 update will be version 3.17 or the final dawning of EbXL 4, it really all depends on how much it breaks. One of the things that it will change, is making configuration much easier to handle. I am already making use of the new ingame mod configuration button, that is provided on the mods screen, to enable/disable extra debug info being displayed in item tooltips. I don’t have a screen shot of the ingame config menu as at the moment it is very much a work in progress, but it will look somewhat similar to how the 1.7 video settings screen looks like. (I am not taking a screen shot of that, you can take a look at it yourself ingame.) Some settings will require a restart as not everything can be changed while Minecraft is running. On that note, we don’t offer the ability to disable the mod in game at the moment as that is presently designed more for mods that don’t add actual content to the game, such as mods that change how grass and leaves render or give you a mini map. I may modify it so that you can completely disable the mod next boot up so it does it show up in the mods list, but at the moment I have other things that are a little more important to finish. The new config system should also be very easy for us to work with as a team, such as adding a new property that can be used anywhere from the config file loading/saving to the ingame mod config screen. This would only take us declaring the property inside the config class, possibly giving it a comment property, a possible restart flag to let people know that they need to restart the game for it to take effect and then actually using it anywhere that it is needed in the code. All in all, that saves us a little coding down the line. Another thing that is changing for the better is that we are making it so that blocks can be defined outside of the code, somewhat similar to how Metallurgy handles their blocks. We already have working code that loads all of our existing normal logs from the json config file. We are going with json (which I am told Metallurgy will also be using in Metallurgy 4) as opposed to csv, as it makes for a much more flexible format in my own opinion, and Minecraft/Forge already come with json decoding/encode support built on in. We are presently hoping to have all of our existing blocks back in to the 1.7 build by the end of the week. Hopefully with the possibility of some of the new planned blocks as well. The new system will also allow our team members who are non coders to add new blocks/sub-blocks without having to touch the code as long as it is based on an existing block type and does not need any new functionality. We don’t have trees or world generation back on line at the moment, as we are trying to make sure that we have a good foundation for going forwards. 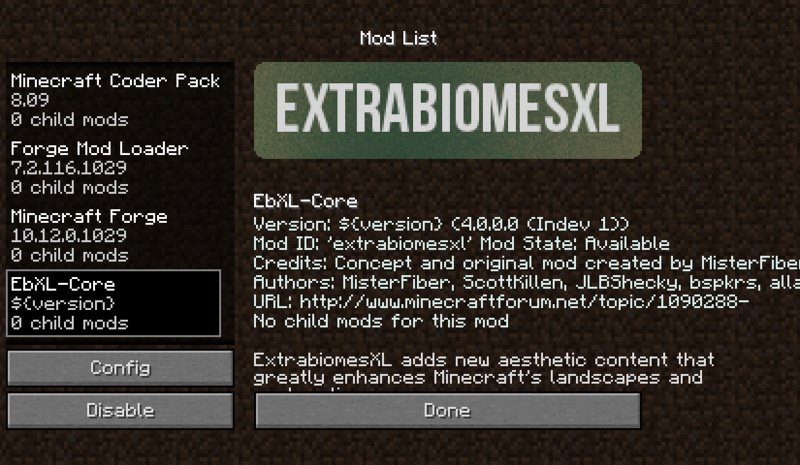 Oh and on that note and since I did accidentally show it in my mod list screen shot, one thing that we are considering for EbXL 4 is splitting the mod up a bit. 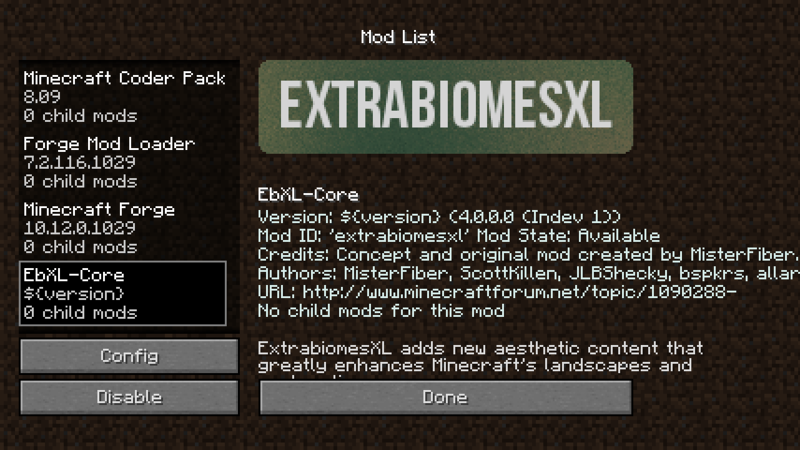 This way people who don’t want everything can download the core part of the mod and then if they want, for example, our fantasy/magical biomes and nothing else they could download only that. Or if you want everything you could download a EbXL 4 Complete, and have all the sub-mods in one jar. Once again, this decision is dependent on how much stuff gets broken in the update, and how much gets added that we have on our list for EbXL 4. We will try to keep everyone up to date as we make progress on the 1.7 update through the end of the month at which time I hope to have a stable build that is good enough for a private beta. I’d talk more about stuff that is in the works but that would leave nothing for the next time I go to update, so that all for now. Previous Previous post: ExtrabiomesXL 3.15.2 – Happy Chocolate Day!